In the digital era, we love innovative live-work areas, but we will always champion playing at home, whether it’s a perfectly placed pool, oversized chalkboard wall, or the ultimate pair of bunk beds. 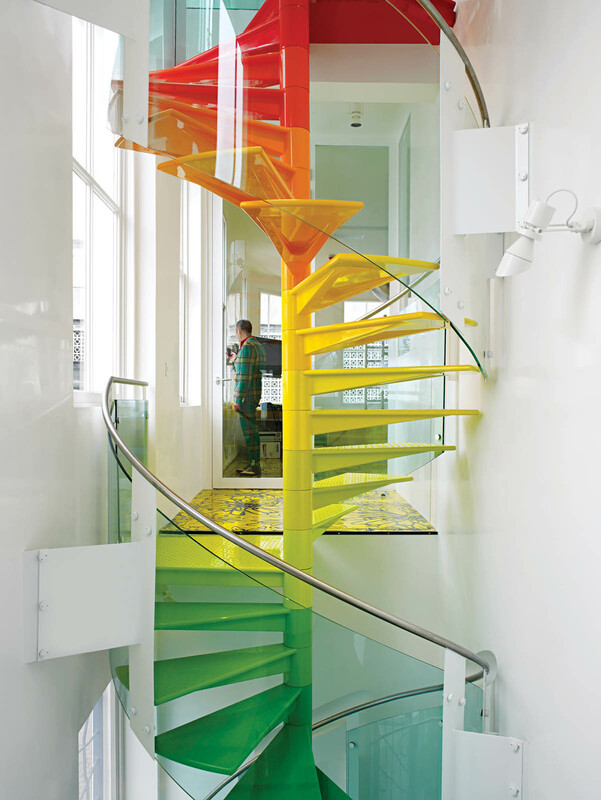 A spiral staircase by designer Ab Rogers provides a prismatic path from floor to floor in a light-filled London home. “Design is not complete without movement,” Rogers says of his Technicolor pièce de resistance. “People move around and over and onto it—I want people to engage with their space.” Photo by John Short. Danish furniture and product designer Nina Tolstrup, who works under the name Studiomama, conceived a huge, freestanding medium-density fiberboard (MDF) cube punctured with circular windows that acts as her children’s playroom inside her London home. Photo by Ben Anders. An upper deck for sunning and entertaining also serves as a diving board in a London couple’s Australian getaway. Photo by Richard Powers. Nooks in an unconventional staircase could be used for storage, but also double as hiding places. Read the full article here. Photo by Jonas Bjerre-Polson. "This trapeze was made by my teacher at circus school," says resident and Oeuf cofounder Sophie Demenge. "I was living in San Francisco in a big Victorian house with roommates. The ceilings were so high I could hang the trapeze and practice at home. Now my kids are taking over—it's the first thing they do when they get up and the last before going to bed." The rug is an old kilim from Turkey; the Eames Lounge chair is from Demenge's childhood living room Paris—"A testament to the great quality of this 30-something-year-old chair," she says. The couch is from Room & Board. Resident Debbi Gibbs’s son Blake had one primary design requirement for their New Jersey vacation home: bunk beds. Specifically, he wanted “two sets of single bunks, one on each side, with a bridge over the top.” Gibbs says the Venetian-style arched bridge connecting the two beds exceeded her expectations: “I was expecting a flat platform, but our builder decided to take Blake’s request (to connect them) and made him his very own Bridge of Sighs.” Photo by Mark Mahaney. Architecture firm Gut Gut designed a modular shelving system out of plywood that gets repeated throughout the apartment. Here, the kitchen island with induction cooktop and the bookshelves are clearly from the same family without looking like twins. A green Dish Doctor by Marc Newson for Magis adds a splash of color next to the sink and a chalkboard wall creates space to play.